New Zealand Art Print News: McRangi - is "Maori Art" selling out or promoting Maori culture? McRangi - is "Maori Art" selling out or promoting Maori culture? 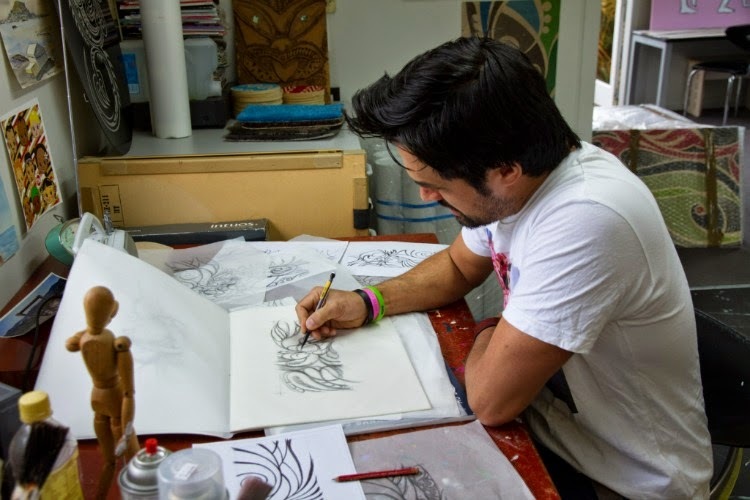 Shane Hansen is one of NZ's most widely known contemporary Maori artists. He has accepted commissions from high profile clients such as Maori Television, Air New Zealand and his artwork adorns the New Zealand Tourism head office in Auckland. He has even followed in the footsteps of Andy Warhol with an art car project for BMW! But he is uneasy about the popularity of a genre known as "Maori Art" in a way that is in some ways similar to our misgivings about the re-branding of non-Maori New Zealand art as "kiwiana". Hansen's new print of a Maori Ronald McDonald figure is his expression of this questioning of the balance between commercialisation and celebration of Maori art by artists like himself. McRangi (pictured above) is a much looser artwork than his usual crisp style based on what Hansen describes as an "old school image of Ronald waving that had a creepy nostalgic feeling about it". In this print McRangi asks in Te Reo "Ko tenei taku titiro kite ao whanui? - "is this how I see the world?". Hansen is wondering if his artworks are cheapening Maori culture or exposing it and communicating it to others in a good way. We don't think that Hansen has anything to worry about as his thoughtful and original series of prints push the boundaries of New Zealand art forward, refreshing and re-interpreting as well as adding a completely new style that is completely his own. But even if there is a less vivid expression of "Maori art" being produced in the gift/souvenir market to meet the current demand that could be seen, as Hansen puts it, to be "cheapening" Maori culture is this anything new?